On Tuesday morning there died at his home here, one who is probably as universally appreciated as any citizen who ever dwelt in our midst. Philander Button was born at North Haven, Connecticut, in 1812. He entered the academy at this place in 1834 to prepare for college, and graduated from Yale in the class of 1839, being the salutatorian of his class. His arduous study had so weakened his eyes that he was unable to conclude the theological course which she commenced and he returned to Greenwich and took charge of the Academy in 1840, which he retained until 1861. He was an efficient teacher and a large number of the most prominent men of the generation now in active business life in this place, as well as many who are well and favorably known to other places, and in fact many in all corners of the globe, owe much to his careful and patient tutoring. 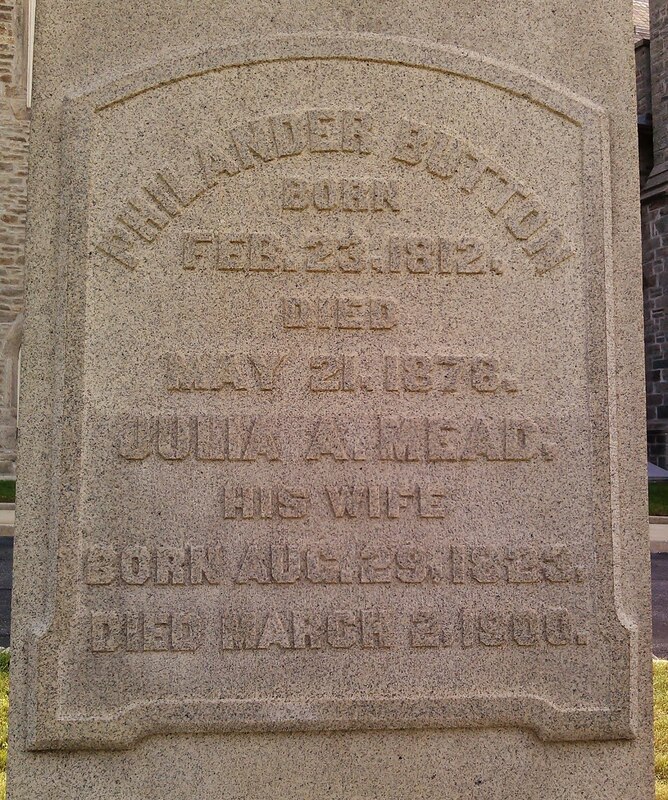 In 1844 he married a daughter of the late Darius Mead M.D. In 1840 he joined the Second Congregational Church and was always prominent in its counsels, being elected a deacon in the earlier years of his membership, and credibly and acceptably filling the position of superintendent of the Sabbath school for over thirty years. Much credit was due to his endeavors in the direction of the beautiful edifice in which the church worships. In 186_ he became associated with Mr. Frederick Mead in business in New York, retiring in 1863. In all public measures he was foremost, never seeking his own advancement, in fact often refusing proffered preferment. Especially was he active and deeply interested in our public schools, being for many years a school visitor. In social life he was affable, genial and hospitable. Few sadder days have darkened all circles here, than when in 186_ he was stricken down. During his active life no man in our midst had a greater influence in public and private affairs, and his influence, always for good, will be felt for years to come. Since that time, though still living in our midst he has been lost to us, and a few men, we may say no man, has been more mixed, or their loss more generally regretted. His funeral will be attended from the Second Congregational Church to-morrow (Friday) at 3 o'clock. Funeral of the late Philander Button was attended on Friday last from the Second Congregational church. The deacons of the church, Messrs. Chas. Mead, Elkanah Mead, Moses Christy, Dr. T. S. Pinneo and Wm A. Howe, and Mr. L. P. Hubbard, clerk of the church, were the pall bearers, and Messrs. Benj. Wright, Alex. Mead, Geo. S. Ray, Whit. A. Mead, Jos. B. Husted and Geo. H. Mills, carriers. Reverend Chas. R. Treat spoke very feelingly from the text "Blessed are the dead who die in the Lord." Rev. S.B.S. Bissell, formally of this place, who was for many years the intimate friend and associate of Mr. Button, spoke of his name "Philander" which means "the friend of men." At the grave, the Sabbath school sang "Rest for the weary," and as each member passed the grave, cast in a sprig flowers. The body was enclosed in an ebonized and velvet trimmed cloth covered casket simple, yet elegant and unique, as well became the receptacle of one whose life among us while casting a lustre on all around him, was so free from ostentation. On Sunday a Sabbath school memorial service was held, at which addresses were made by a number of the older officers and teachers and the following resolutions adopted. Resolved-That we as a Sabbath school do sincerely mourn, as we realize his removal from the position of Superintendent, which he so wisely and except the filled for more than 30 years. Resolved-That he being dead, yet speaketh to us, by the memory of his bright example of faith and good works, and we hope to be influenced to follow him as he followed Christ. Resolved-That we have sympathized with him, and his family in the long and trying period between his removal from active work, and his final call to be with his Lord. Resolved-That in his removal to his heavenly home, we have lost a leader and friend to whose watchful love and inspiring words we owe more than we can express. Resolved-That in his untiring zeal for the Master and earnest, unselfish labors for his fellow men he has shown us how closely it is possible for us to obey the command to love God and our neighbor. Resolved-That we tender to his bereaved wife and family our warmest sympathy in their great affliction, praying for them that the God of all comfort will sustain and bless them as he has promised and is able to do. Resolved-That as a token of our feelings under this afflictive providence this school room be appropriately draped for thirty days. Resolved-That a copy of these resolutions be presented to the family of the deceased.